Nokia Italia have just now activated their Nokia N8 preorder page. This is the first official confirmation of a final price for the N8. The page mentions that customers should expect their N8 to be delivered at the end of September, which is inline with Olli-Pekka Kallasvuo's statement of "end of Q3". 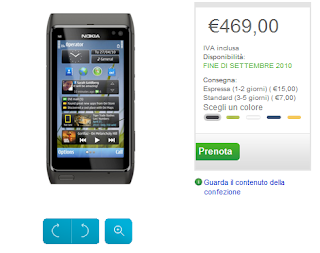 At €469, it's about €100 more than Nokia's pre-tax estimate for the N8's price, which sounds about right. Stay tuned for the other international Nokia branches to announce pricing and availability dates in their respective regions.